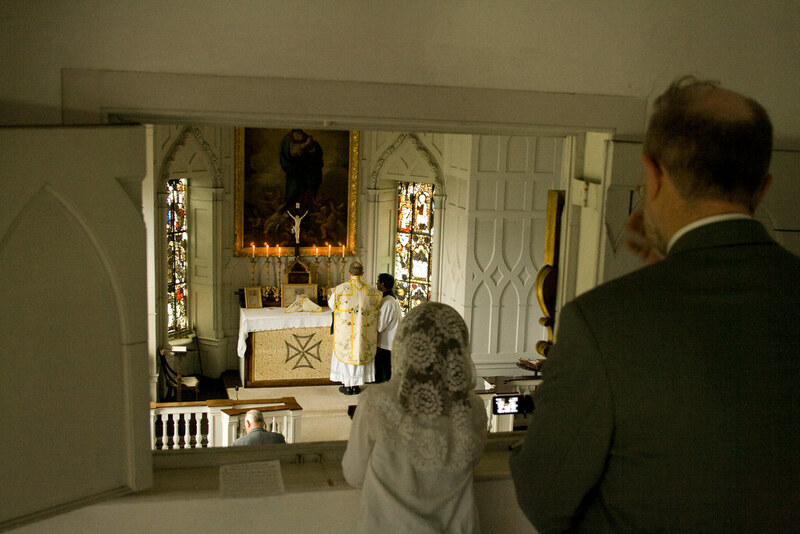 With all the things happening I haven't had time to blog about this, a beautiful Mass we had on 19th June in the private chapel of Milton Manor House, thanks to the hospitality of Anthony Mockler-Barrett, the owner. In the choir loft in Milton Manor Chapel. This chapel was consecrated by Bishop Richard Challoner, and our celebrant, Fr Simon Leworthy FSSP, used Challoner's altar cards, vestments and chalice. The Mass was a Votive Mass of Our Lady and was accompanied by the Schola Abelis, the last Mass of their schedule for the academic year. They sang a polyphonic Ordinary, Francisco Guerro's Missa Beata Mater. The Schola is the ONLY Catholic choir each year in Fresher's Fair, though I hope this may change. Equally surprising is the fact that our polyphonic section is also the ONLY Oxford choir of any kind specialising in Renaissance music. It now has the right to use the University's name, and call itself the Oxford University Gregorian Chant Society. The schola has had a very good year. We have more town-based people singing for us now, which means there are more resources for Masses in the vacations. We are planning more Saturday Masses for next term, and more training for members. See the Schola's blog for more about them. 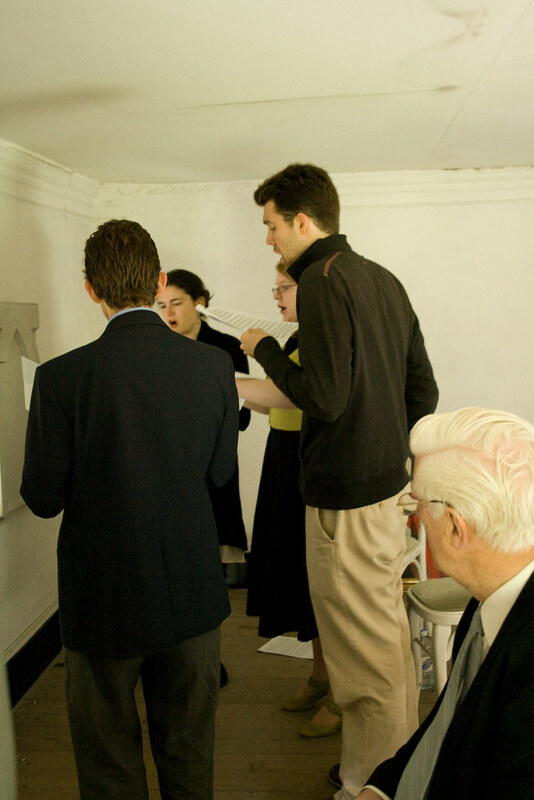 We made a good sound in Milton Manor; here are the polyphonists singing a motet. There are more videos here, and more photos here. 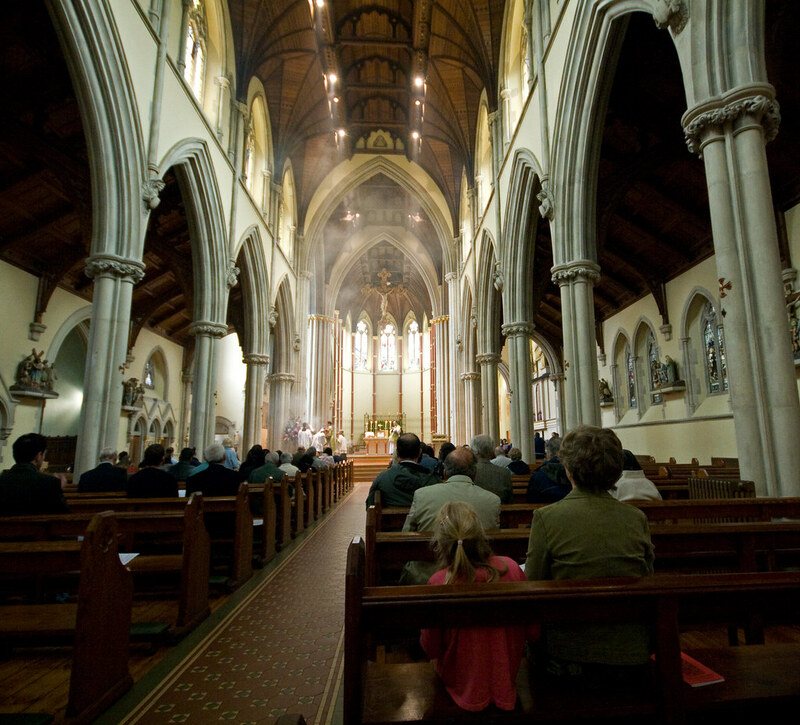 The Latin Mass Society Annual General Meeting took place yesterday. As usual we had a report from the Secretary and from the Treasurer, a speech by the Chairman (me) and a speech from a guest, this year Fr Michael Brown, the LMS' new Chaplain for the North of England. Fr Brown has a blog, Forest Murmers, and was a tutor at the Latin Mass Society's Ushaw Priest Training Conference. 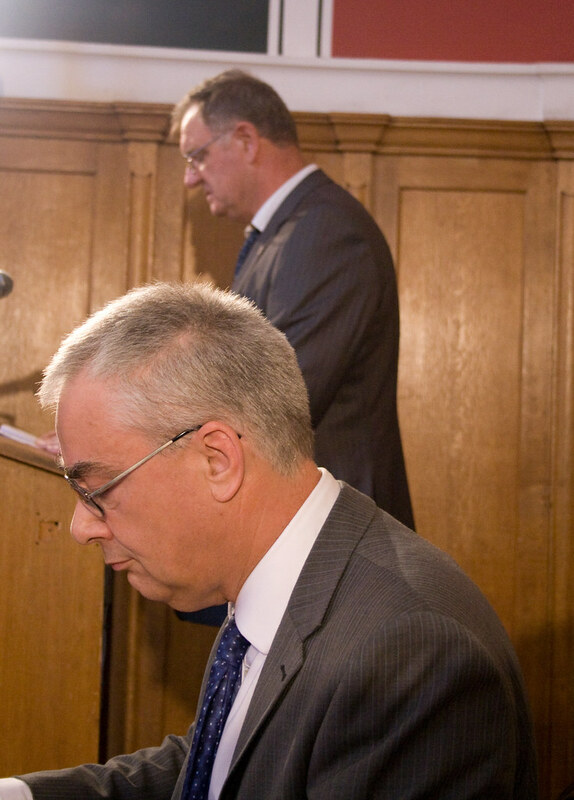 The Treasurer, Paul Waddington, gives his Report to the AGM; Paul Beardsmore, the Secrecary, is in the foreground. At the AGM Paul Beardsmore retired from his post, to take up the post of Deputy Chairman, to be replaced by David Forster. The Secretary was able to announce the retirement of John Medlin as General Manager of the LMS; he will continent to work for us part-time as Magazine Editor and Publicist. John was the first to hold this job in it's present form. He is succeeded by Neil Glanfield, who (unlike John) will be full-time. Fr Brown gave a very interesting talk on the usefulness of the Latin Mass Society in supporting traditionally-minded priests, and the difficulties we all still face after the motu proprio Summorum Pontificum. 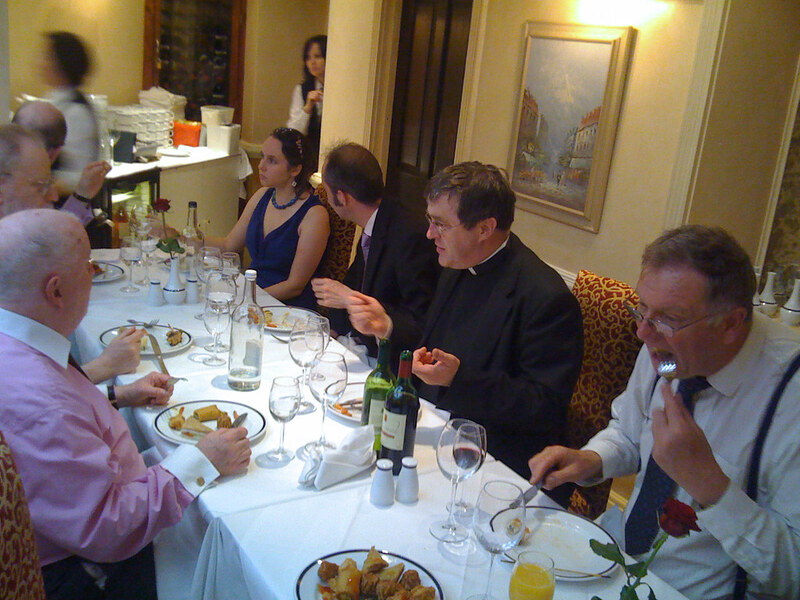 Fr Brown and others at lunch after the AGM. At the end of the AGM we sang the Creed (Credo III), as is customary. Then the Committee members and Representatives had a buffet lunch round the corner, before the splendid Pontifical Mass in Westminster Cathedral celebrated by Bishop Hopes. Here is the text of my own speech. Father Brown, ladies and gentlemen. This time last year I set out a long list of house-keeping matters which urgently needed to be done within the Society, and a number of things which we were planning for the Society to do in developing its work. Our retiring Secretary has given an indication of how far we have got down that list, and I hope you will agree that we have done pretty well. I won’t tell you how much effort was required to achieve each of these things, because it would take too long, and anyway you wouldn’t believe me; all I will say is that I’m glad we won’t need to do any of them again for a good long while, let alone all of them at once. I am extremely grateful to the Officers, and especially to our retiring Secretary Paul Beardsmore, whose role meant that he was involved in all of these projects, and whose wise counsel and hard work was indispensible to them. But while the Society has been getting itself organised internally, and has even launched new apostolates, the situation on the ground presents a paradox. Three years after the Holy Father liberated the Mass with his motu proprio Summorum Pontificum the Traditional Mass is flourishing in many places, but still faces apparently insuperable obstacles in others. Paul Beardsmore has given us some statistics which show that, overall, the number of Masses has risen considerably, and we know scores of priests who are gearing up to do more in their parishes as they gain in confidence. But we also know that some of these Masses are very thinly attended, that some congregations appear to be aging, and that the rightful aspirations of those attached to the Church’s earlier liturgical traditions are still not being fulfilled in many places. There seems to be a mismatch between the youthful enthusiasm for the Traditional Mass which is very evident on the blogs, in certain parishes, and at certain events, and what is happening in other parts of the country. There are complicated reasons for this, including many to do with local conditions, but on the subject of youthful enthusiasm I think it is fair to say that up to now the Society has not been especially good at harnessing the energy and ideas which young people frequently have. One reason for that is that for a long time its mission has necessarily involved more diplomacy than activism. There are many things which we would have liked to have done, but haven’t done to avoid offending people, or treading on people’s toes, or even to avoid drawing attention to ourselves or to our events. Many here will have had the feeling that the more popular a Mass was, the harder it could be to get the permissions necessary for it to continue. Experience, caution, even paranoia, were the qualities needed to cope in this environment. With the motu proprio things have not changed completely, but they have changed enough for our emphasis to shift towards activism. The Society has always wanted to be an activist organisation, making things happen, and the long period in which we were hobbled in our activism has been a painful one. The new environment allows us to be ourselves, to do more of the good and important things we want to do for the Church and for the good of souls. For the Society this means a change of tempo and a change of culture. I hope these things will be reflected in the new website, and the new membership materials we are preparing. I hope it will encourage more people to join. What it will certainly do, and what it is already doing, is to enable us to make better use of our members and volunteers. We can now far more easily adopt the bright ideas and harness the energy which is out there. And whereas the energy and ideas of individuals could easily become confined to a single parish or project, in the context of the Latin Mass Society they can more easily benefit the whole of England and Wales, and indeed the whole Church. This last point, about the value of the Society as an organisation, is worth emphasising. It has been said a number of times that we are less necessary after the motu proprio, but this is the reverse of the truth. Only after the motu proprio is it possible for us to do, in a straightforward and direct way, what we were set up to do. There is nothing in our constitution’s list of charitable objects about negotiating permissions under indults. What it says is that we should be promoting the Traditional Mass, we should be promoting Gregorian Chant, we should be promoting Latin. These are things which we can do far more effectively after the motu proprio than before, and I am glad to say that these are all things we are indeed doing far more effectively now than in the past. To help us in our work we have, over many years, gathered together expertise of various kinds, financial resources, an office with paid staff, and a national network of members and active volunteers, a national organisation which it would probably be impossible to replicate if anyone were to try from scratch starting today. This organisation is something which amplifies the effort of individuals within it. The amplification of individual effort is the point of organisations of all kinds: that is why they exist. By coordinating people they can achieve more, for the same level of effort, than a lot of individuals working in isolation. People working in what we might loosely call the Traditional Movement outside the LMS should be reminded of this. If you want to do something for the Church, but have finite time and energy, then collaborate with others; if you are in England and Wales, collaborate with us. We can set your efforts into the context of a network of people who will supply your deficiencies and make the most of what you have to offer. This brings me back to the question of harnessing the palpable energy of people attached to the Traditional Mass. We can harness it by helping them to do the things they rightly want to do for the restoration of Tradition. When I started to canvass for support among choir directors and chant experts for the Gregorian Chant Network, I was told again and again that they had been waiting for years for something like this to be organised. When David Forster launched the Society of St Tarcisius, people came from all over England to attend, and people have joined the new sodality with whom we had no contact before. We are pushing on an open door. Not only that, but in doing these things we bring into the Society, or into active work for the Society, people who want to do something positive for the Church in these areas, and will help us take these and other projects forward. Far from it being the case that these kinds of projects sap the time and energy of the office and Committee, they are actually a way of revitalising the Society and bringing in human resources for all of our work. Another initiative we have undertaken this year is a walking pilgrimage to Walsingham. I have myself been for the first time on the great French pilgrimage from Paris to Chartres, whose British contingent is supported by the Society. This is a wonderful experience and I encourage all who can to make the effort to go. Not everyone on the pilgrimage of more than 10,000 people is under forty, so you needn’t rule yourselves out on that ground, but naturally most are, and it is a wonderful example of how a totally traditional devotion appeals to new generations of people. Inspired by this, and by the similar Christus Rex pilgrimage in Australia, as well as the millennial native tradition of walking pilgrimages to Walsingham, we can now announce that a group will be walking the 50 miles, or most of it, from Ely Cathedral to the Catholic Shrine at the Slipper Chapel at Walsingham, arriving on Sunday 22nd August, with Sung Masses on each day. I will be there; there are flyers at the back for anyone interested in joining us. The Gregorian Chant Network, the Society of St Tarcisius, and the new residential Latin course we have initiated this year all have a long way to go before they are fully developed, but we have made an important start. There are two other broad areas in which the Society, it seems to me, needs to develop. One is in providing more opportunities for members to meet, to create a real sense of being fellow members of the Society, and a sense that the Society is something it makes sense to join. Another is in providing more spiritual sustenance for members, a sense of spiritual co-operation and something to sustain the spiritual life between Sundays, especially for members living far from each other and far from regular Traditional Masses. Both of these can and should be addressed in many ways simultaneously, but we have already instituted two small things which should help. 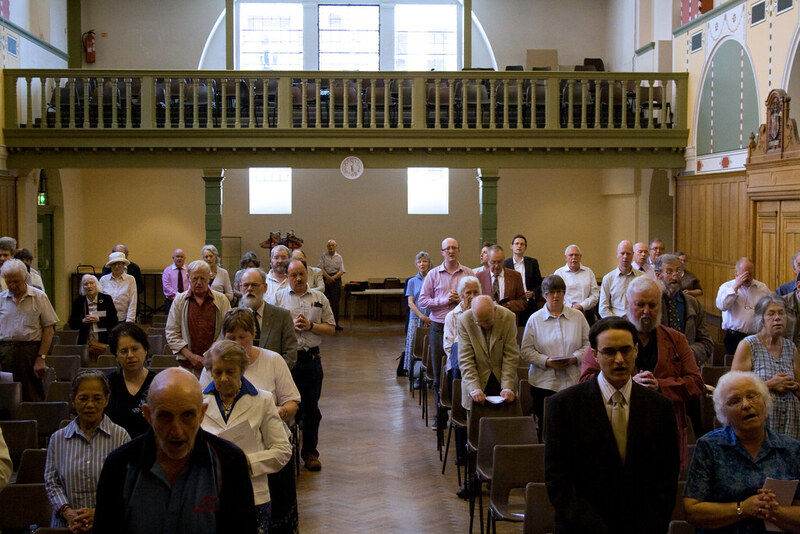 One is the system of regional chaplains, who I hope will begin to lead at least occasional events which are not only in London or the South East, but also not purely local: days of recollection, for example, such as will be worthwhile for members to travel to attend from all over their region. Another is the new policy agreed by the Committee making provision for the spending of central funds for music at local pilgrimages and other important local events. I have long considered the Society’s many pilgrimages, organised tirelessly by local representatives, one of the most interesting and edifying works the Society does; they are also a very longstanding tradition in the Society. I hope that the in conjunction with the support we are giving the Society’s many scholas, we can foster the growth and improvement in the quality of liturgical music at the Society’s events, something which is of enormous value in demonstrating the beauty of the liturgy to newcomers. On the subject of newcomers, one important project for the immediate future which I can mention before I end is a membership drive. This has been in preparation for some time; it requires the complete revision of our publicity materials, a new advertising strategy, and of course our new website must be in place before we can start. I hope it will take place in the Autumn, and perhaps we will even see some results by the next AGM. Before the hoped for new members arrive, however, I should like to take the opportunity to thank you, our existing members, who have stuck with us through thick and thin. This is your Society, and I hope we will have your support in developing its work in the exciting times through which we are now living. After our AGM we had a beautiful Mass today in Westminster Cathedral, celebrated with great dignity by Bishop Alan Hopes. It was the Feast of SS John and Paul, martyrs, and was accompanied by the Lay Clerks of Wesminster Cathedral, directed by Martin Baker, the Master of Music, who sang the Mass 'Quarti Toni' by Tomas Luis da Victoria. 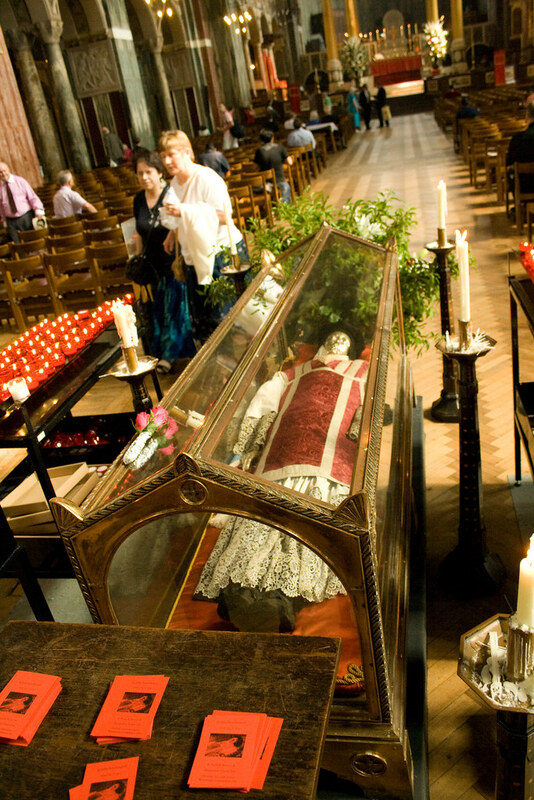 By coincidence, the relics of St John Southworth were in the nave for veneration, since his feast-day is on 26th. More on the AGM to follow. It's unlike me I know but this is an ushamedly personal post. My mother, who paints as Anthea Craigmyle, is having her annual Open Studio (with the other artists of the Chiswick Mall): Cedar House, Chiswick Mall, W4 2PS. Anyone can walk in over the weekend and look at her latest - and buy some too if you fancy. Moat are domestic scenes but she does religious paintings sometimes, here's the Entry into Jerusalem. Windy outdoor scenes have featured a lot over the years. There are always some tiny ones to suit every pocket. and a Solemn Mass on Sr James' Spanish Place, the newly ordained Fr Harkins has visited the Fraternity apostolate in Reading, and celebrated another Solemn Mass here. After Mass we all queued up for a blessing. The LMS office has just issued this press release. Expert tuition in the celebration of Mass in the Usus Antiquior will be provided on a small group basis. There will be tuition in Low Mass, Missa Cantata and Missa Solemnis and there will be streams for beginners and more advanced students. Tuition will also be given in the other sacraments and in Latin. There will be opening and closing High Masses, daily Mass, Offices and Rosary. There will also be a closing Conference dinner with guest speaker. 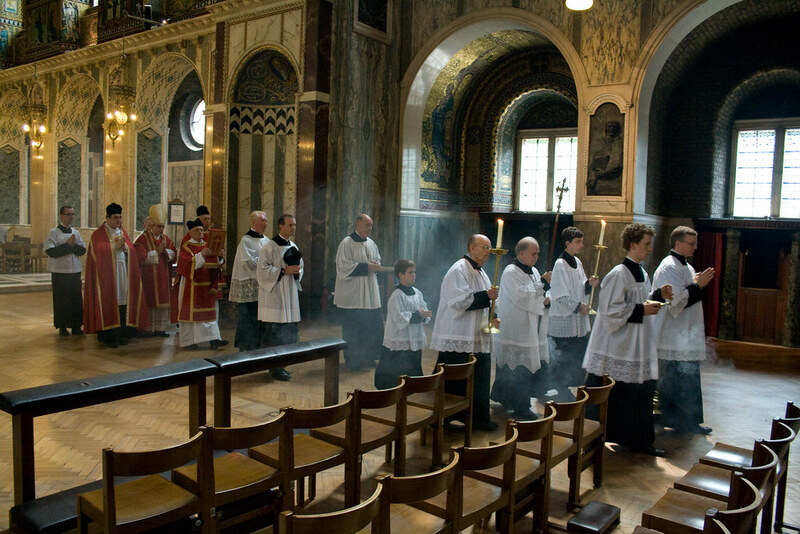 Running alongside the training for priests, the Society of St Tarcisius (the LMS’s newly-formed sodality for Traditional altar servers) will organise a residential training course for servers and MCs. Further details can be obtained as above. I have just received this from a fellow member of the Una Voce Federation. Sounds interesting ! One of the obstacles for priests celebrating the TLM can be their lack of knowledge of Latin. "The Sapientis Institute (http://sapientisinstitute.org/home.html) is making 10 places available to clergy, religious and seminarians who would like to learn Latin. This is a Beginner’s Latin class which has started and so it would be wise to encourage clergy to get signed up soon.. The course is free to the first ten clergy, religious, or seminarians who apply. Lectures are delivered live in an on-line classroom that allows students to see the lecturer and follow his presentation. This allows students to study from home. Students can use a mic. to communicate with the lecturer. All lectures are recorded and are available for students to download. Homework assignments and self-assessment test can be sent to the lecturer for correction. Applicants merely need to send an e-mail expressing their interest to theschoolmen@societyofscholastics.org. " These courses are offered only in English. Although officially 10 places are available the Sapientis Institute will do their best to extend the offer to as many clergy as possible. If you have blogs/websites feel free to post this offer on them. If you know of laity who are looking for a Latin course it would be a kindness if you could also notify them of the course. Having paying students allows the Sapientis Institute to offer the course to clergy for free. "The course is also open to non-clergy/religious. All students can take advantage of a three lecture trial period. During the trial period they can attend the lectures, obtained downloads and evaluate if this course suits their needs. Our pricing structure is unique. Course fees cover every one in the family as long as they are using one connection to our classroom. Press release from Leo Darroc, President of the Una Voce Federation. NEW MEMBER OF THE FEDERATION. I am pleased to inform everyone that the Council of the Una Voce Federation has approved an application for membership from the Ecclesia Dei Society of St. Joseph – The Philippines. 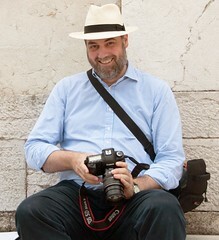 The leader of this group is Carlos Antonio Palad whose name you might recognise from his work on the Rorate Caeli web log. The situation in The Philippines is difficult for those who wish to attend the traditional Mass so we send the members of this new group our best wishes and prayers for the resurgence of the traditional liturgy in their country. It is our fervent hope that membership of the Federation will enhance the standing of this society in the Philippines, especially in its dealings with the hierarchy. The name of the Ecclesia Dei Society of St. Joseph – The Philippines, will be added to our website. Leo Darroch, President – Foederatio Internationalis Una Voce. 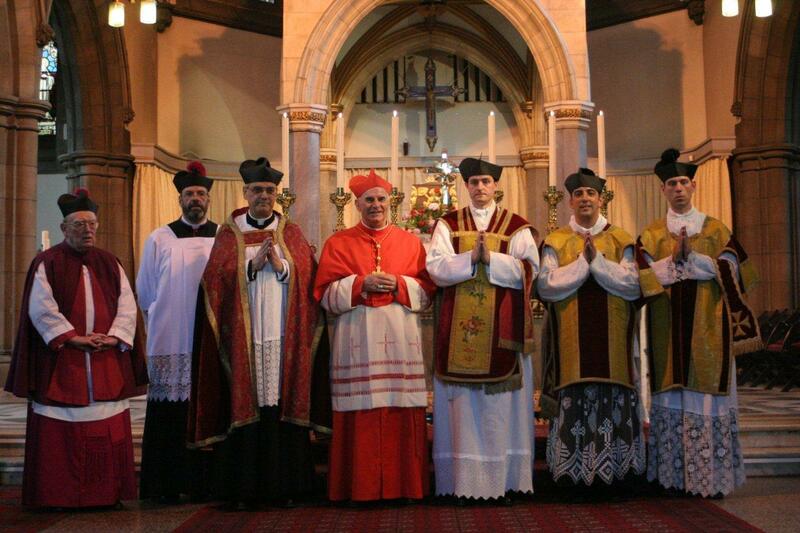 Fr Simon Harkins FSSP, recently ordained in the newly consecrated chapel of the Fraternity of St Peter seminary in Denton, Nebraska, said his first Mass in Britain in Edinburgh, in the presence of Cardinal O'Brien. The monks of Papa Stronsay were there, and have some lovely photos on their blog. 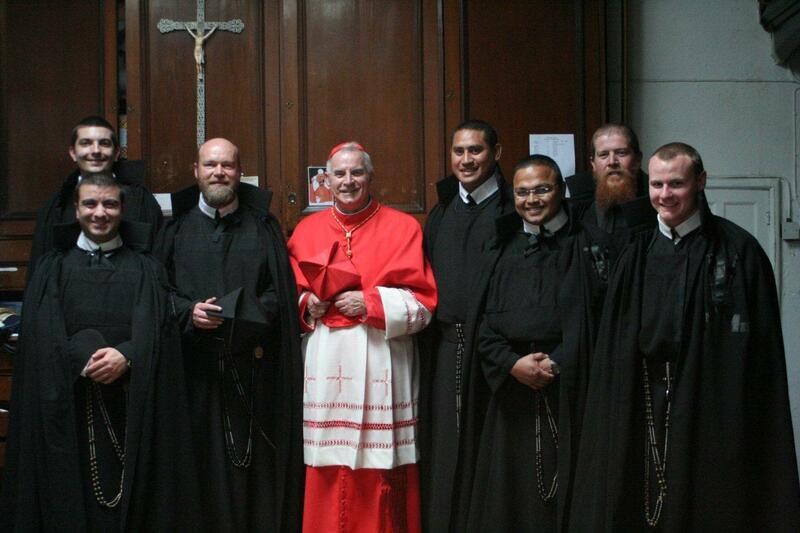 Br Martin, from Oxford, is in the back row on the left. 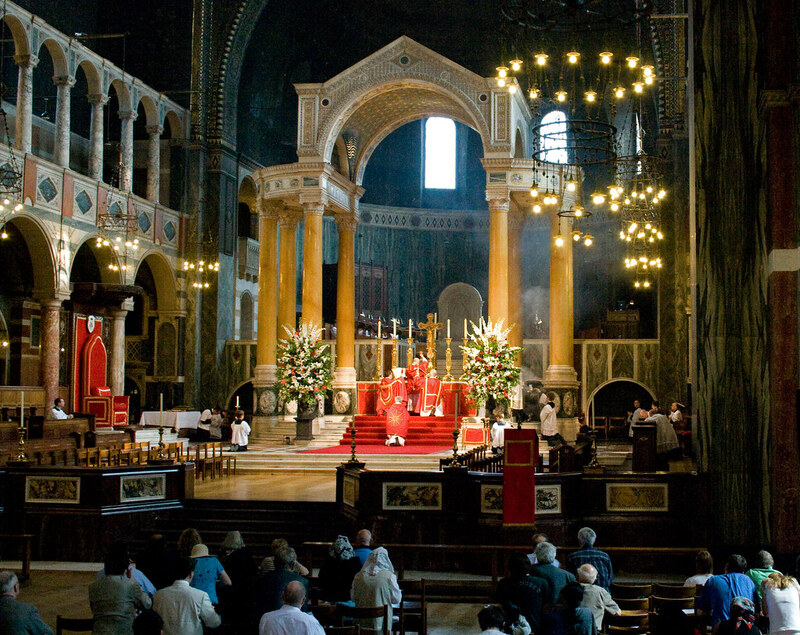 Fr Harkins will be saying another Solemn Mass in London, in St James' Spanish Place, this Saturday, 12th June, at 3pm. All are welcome, both beginners and advanced students. Led by the Abbot of Farnborough Abbey and a director of the Schola Gregoriana of Cambridge. The workshop begins at 10am and concludes with Vespers and Benediction at 4pm. To register, contact: chantnetwork@gmail.com or Tel: 023 92862384.